I’ve been giving some thought to the peaks and valleys that make up this landscape called life. At times, the mountains we are tasked with climbing seem impossibly high, while the valleys into which we descend seem far from the sun’s light. We traverse raging rapids, as well as enjoy the occasional respite of a gentle stream; we feel the burn of blistering heat, and the cooling waves of a much-needed breeze. This landscape translates into joy, sorrow, pleasure, pain, and a myriad of other experiences and emotions. There are obstacles. Some, we experience for a few passing moments, while others, we battle or endure for the better part of a lifetime. Some, we choose. Others are chosen for us, by environment, by circumstance, maybe even by our genes. We each have a deeply personal experience while we are here on this earth. No two lives are exactly alike. We each fight battles that at times, are very difficult to understand. Casting stones is a choice. Further, casting stones can be cast aside. It’s understandable that we want to explain the difficulties of life. As humans, we have an innate need to explain what’s going on around us. ‘What’s the root cause?’ we want to know. Why is someone dealing with disease, disability, illness, cancer, depression, divorce, abuse, violence, or some other trial? In some cases, answers are readily available. Other times, there are no answers – or at least, no satisfactory answers. Regardless of the answers or lack of them, regardless of how the obstacle came about, we have a choice in how we respond to those who are suffering. We have a choice in how we educate, teach, and spread awareness about these things that trouble us. Whether we lift and encourage, or diminish and discourage – it’s a choice. This doesn’t mean that we can’t share our deeply personal journeys of pain and heartache. It doesn’t mean that we have to turn a blind eye to injustice, burying painful experiences deep within ourselves, for fear of inadvertently casting a stone. It also doesn’t mean that we have to agree with everything and everyone. It does mean that we should be less judgmental of the heartache and suffering of others. 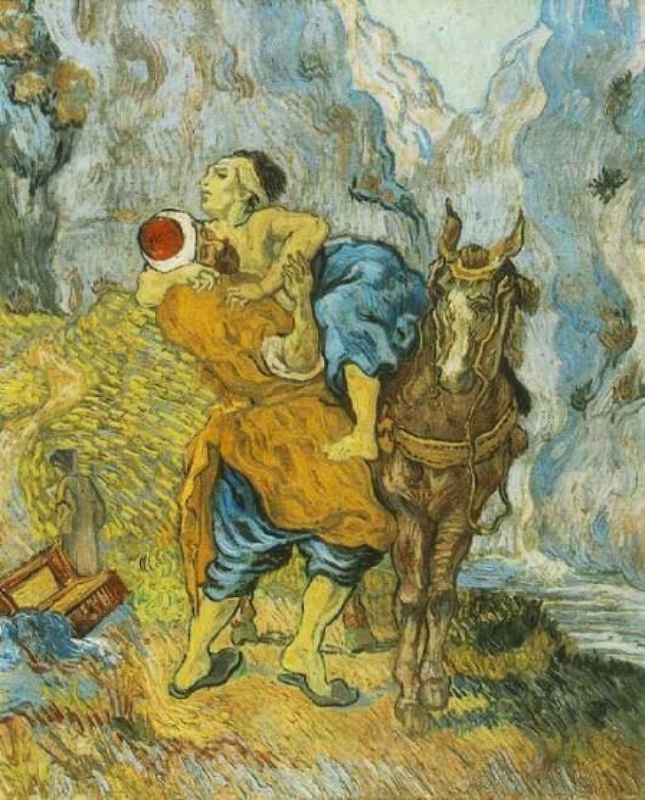 It means when we see others suffering, robbed, stripped, and dying along the proverbial highway of life, rather than haughtily distancing ourselves while wondering how they brought about such misfortune, we choose to follow the example of the Good Samaritan. We treat them as we would want to be treated. 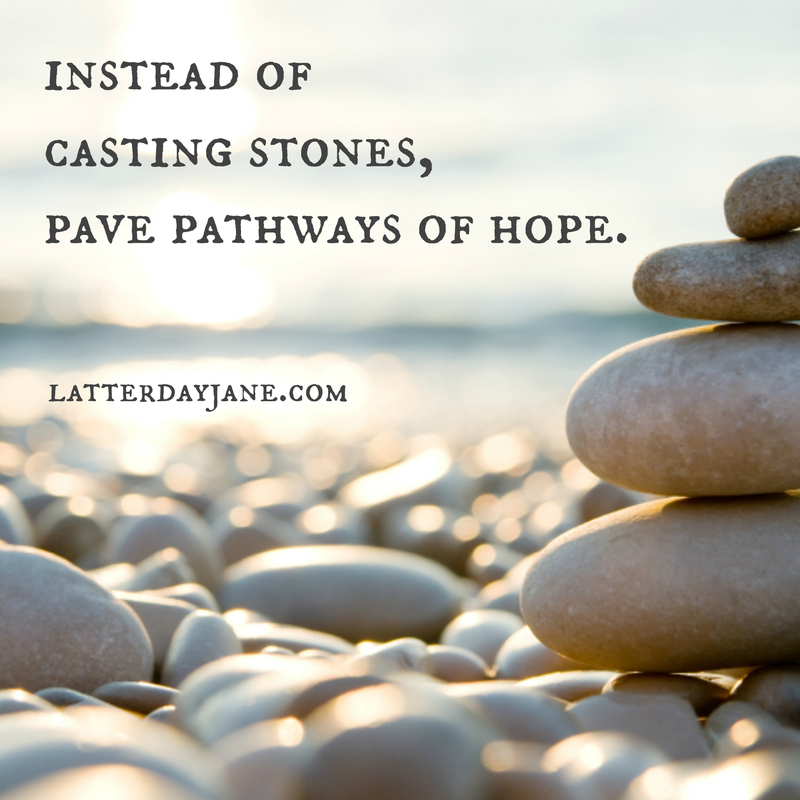 Instead of casting stones, we can choose to pave pathways of hope. Our struggles here on this earth are part of the reason we’re here. They bring about learning and growth. They give us the chance to lift each other, share our experiences, and ultimately, to choose whom we will serve and how we will live our lives. Our loving Heavenly Father has far more compassion for our broken spirits and bodies than we can fully comprehend. Only He truly knows our minds and our hearts. Categories: Chronic Illness, Depression | Tags: casting stones, Chronic Illness, compassion, depression, divorce, Good Samaritan, Matt Walsh, Robin Williams, suicide, Vincent Van Gogh | Permalink. Robin Williams was a warrior. A brave warrior on a field of battle. He was one of many–soldiers, standing shoulder to shoulder, stretching out towards the horizon–and yet, he was so very alone. Yes, he was also a husband, father, and friend. A beloved actor and comedian. An innovator. A visionary. An unassuming funnyman whose dyed-in-the-wool dedication to his craft made us laugh, made us cry, and made us think. Yes, the characters he played helped us experience life through the eyes of modern day pioneers: teachers, mentors, doctors, fathers–real people–trying to make a difference as they worked to shape the world while navigating life’s complexities. And yes, all of these things aside, he was a warrior. Ultimately, this war-weary soldier put his weapons down on the field of battle, raised a tattered white flag as far as his arms could lift it in the heat of a scorching sun, and surrendered to a crushing battle with depression, in an apparent suicide. When a precious life ends in this way, there are so many questions, with an infinite combination of possible answers. In that endless loop of hypotheses we form, we sometimes allow ourselves to come to overly simplistic conclusions. We focus on one battle lost, ignoring the preceding years, months, days, even hours, where so very many battles were valiantly won. Williams’s life was not perfect. No person’s life is. He struggled mightily with his demons. So do we all, at one time or another. As millions of others do, I desperately wish he had continued his fight. I wish his journey had ended differently, peacefully, in some faraway future. It didn’t. 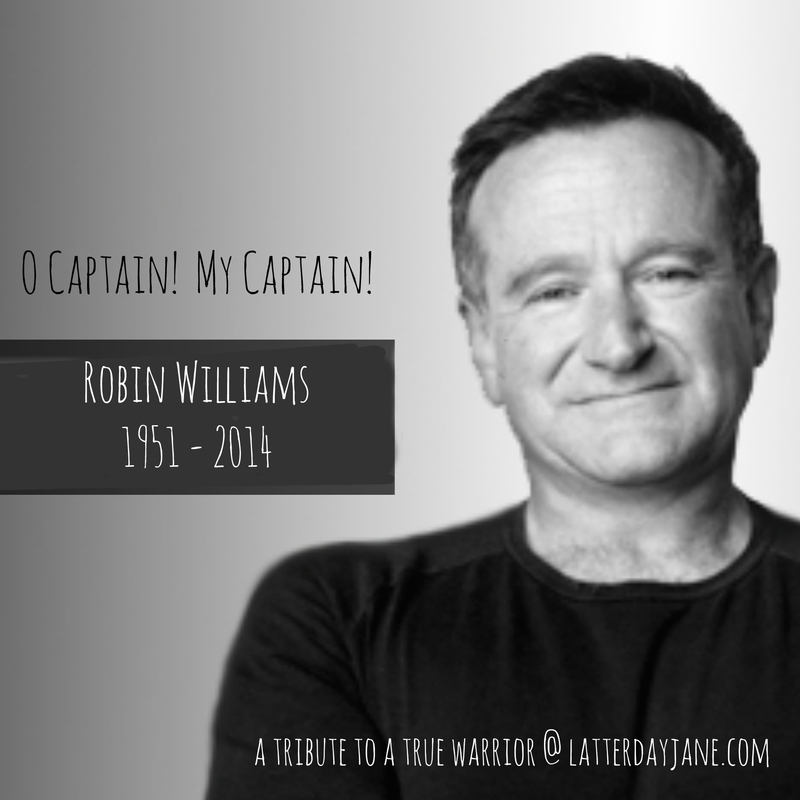 Even so, Robin Williams is more than one battle lost. This final fall on the field does not mean his life has been somehow stripped of dignity. It is not suddenly void of eloquent meaning. The medals he earned are not tarnished and unrecognizable. His life mattered. His life still matters. He gave it his all. Depression, suicide, and mental illness as a whole, is something we fail to fully understand. Sometimes, it is something we choose to fail to understand, which is a far more serious thing. We understand breast cancer. We understand diabetes. We understand heart disease and high blood pressure. We pin on our awareness ribbons, as we don appropriately colored attire for support walks, taking part in an honorable wave of community awareness. But depression? Depression is another thing altogether. It is sometimes dismissed as a weakness, or a flaw in character, rather than the illness it truly is. And rather than colorful ribbons and community events, we sometimes draw into ourselves, hoping an ounce of compassion shown from an arm’s length away will somehow be enough. We can do more. We can take away the stigma. We can stretch forth our hands. We can offer a shoulder. We can seek to better understand. 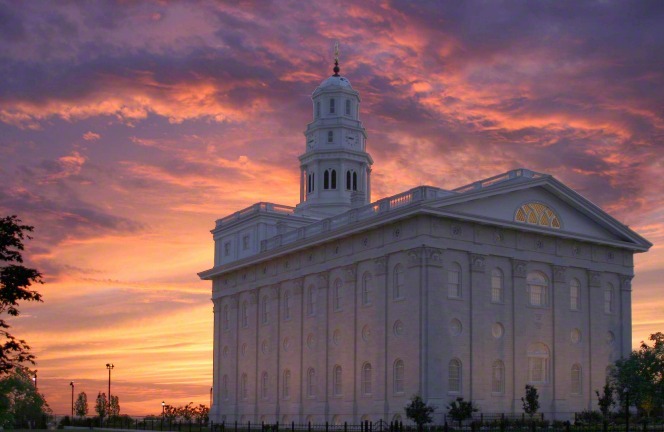 I think Jeffrey R. Holland expressed it well when he said, “While God is at work…the rest of us can help by being merciful, nonjudgmental, and kind. For those still on the field of battle: shoulder to shoulder, the march goes on. In other words, Carpe Diem. Live. Live one minute, one hour, one day at a time. But live! Categories: Chronic Illness, Depression | Tags: Carpe Diem, Dead Poets Society, depression, like a broken vessel, mental illness, Robin Williams, Robin Williams suicide, suicide | Permalink.